New Zealand's court at the 1886 Colonial and Indian Exhibition in London was organised by Julius Haast, who was also the director of Canterbury Museum. Observers interpreted it as showing the progress of the country from 'Old New Zealand' to a thriving European colony. 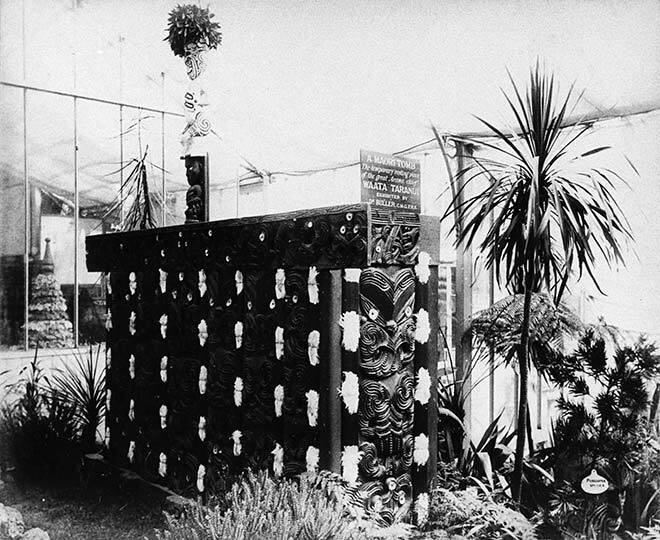 The central section included an extensive collection of Māori artefacts, including this tomb of Ngāti Pikiao chief Te Waata Taranui. The chief's body had been removed. The Māori display also included an impressive pātaka (storehouse) from Te Arawa, extensive collections of woven mats, models of waka, and cases of adzes and weapons. The material had been collected by naturalist Walter Buller. Other sections included, as at previous exhibitions, a fernery, native woods, furniture, manufactured goods – including some beer, which was well received – and the usual paintings showing the beauty of New Zealand.